The National Society Daughters of the American Revolution (NSDAR or DAR) is a non-profit, non-political, volunteer women’s service organization comprising 3,000 chapters and over 180,000 members. Chester County Chapter, NSDAR, was founded in 1894. We have a rich history of serving Chester County, Pennsylvania. Who are Chester County DAR women? We are women who are active and passionate about community service, preserving history and educating children. We honor and support those who have served our country. Our chapter has over 140 members, with varied backgrounds and the whole spectrum of ages. From our Junior Members (ages 18-35) to our regular members, we are involved in various professions from college students, doctors, teachers, professional working women, mothers, grandmothers and retirees. Whatever your interest may be, you can find friendship and have fun at our meetings. We are a 100% volunteer service organization. We hold an annual luncheon in the fall and a Bingo fundraising event in the spring which help us achieve our chapter goals, as well as support our national organization’s projects. These events are always popular and well attended by members and guests. Chapter meetings are a wonderful place for networking, education, patriotism, culture and history. We meet monthly either on a Monday or Saturday from September to May. There is no meeting in January. We have a variety of activities throughout the year. Our members regularly volunteer at the Coatesville Veterans Medical Center. We work with area schools each year to recognize students and we participate in community events. 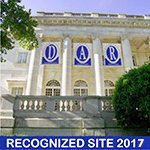 Interested in joining DAR? Any woman, 18 years or older, who can prove a lineal descent from a patriot who rendered military, civil, or patriotic service is eligible to join DAR. If you are interested in becoming a member of our chapter, please contact us. We would be delighted to help you trace your family back to your Revolutionary War patriot. Please visit our National Society for more information regarding membership and the application process. You are welcome to visit us at our meetings or events. Please join us and become acquainted with the caring and devoted women who carry on the valuable work of our long-enduring chapter. Agendas, Minutes, Financial Reports, Etc.